Diamonds. We want to shine bright like one. Or more so, we'd like our finger to shine bright. Our ring finger specifically. If you're anything like us you feel secret delight when a newly engaged celeb flashes their bling. That sparkle, the little hint of luxury; there are few ladies who wouldn't want a glimmer of glamour of their own. Valentine's Day is just around the corner and well, it's at this time of year that one gets to thinking about engagements and the like. It's only natural. It is! No matter how much - or little - you know about carats and the like, you know yourself what your taste is. We've picked our Top 3 celebrity engagement rings and - SURPRISE! - our friends at Voltaire Diamonds have matched them. The truth is, you don't have to be rich and famous to have an A-list style engagement ring. We have the low down on these gorgeous rings and an example of a similar style from Voltaire Diamonds that could certainly look amazing on your lovely hand. Rosanna Davison's ring is a cushion cut diamond in a solitaire style. In the band are pavé set graduated diamonds. Blake Lively's ring is an oval cut, also in a solitaire setting and also with pavé set diamonds in the band. Her diamonds are set into rose gold. 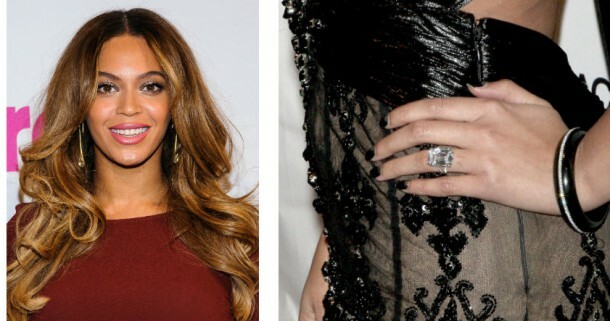 Beyonce's ring is an Art Deco style emerald cut diamond. The centre stone is flanked on either side by tapered baguettes. Jay-Z reportedly spent around $5 million on Beyoncé's ring but obviously you could have a similar style without the humongous price-tag. Carat weight and quality is determined by individual preference and Voltaire Diamonds can tailor-make these rings. Do you have a dream ring? Is there any celebrity rock that you adore? You could use those ideas as a launchpad for receiving the ring that was meant to be on your finger with Voltaire Diamonds. Who knew she was a Trekkie? !